1691: he starts his career in Kyôto, performing under the name of Sodesaki Iroha. 9th lunar month of 1695: Iroha plays at Miyako Mandayû's theater the role of Princess Matsuyoi in Chikamatsu Monzaemon's drama "Mizuki Tatsunosuke Tachiburu Mai". 8th lunar month of 1697: Iroha plays in Kyôto at Miyako Mandayû's theater the role of Meshitaki Tama in Chikamatsu Monzaemon's drama "Momoyo Komachi", which is produced by Sakata Tôjûrô I. Fall 1698: Iroha settles in Ôsaka. Fall 1699: Iroha goes to Edo. 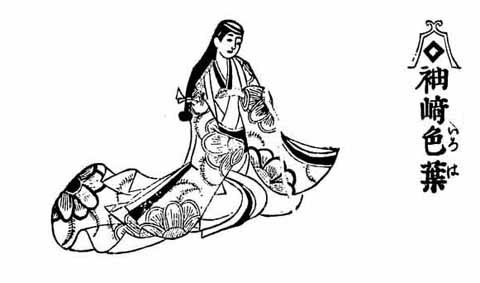 11th lunar month of 1699: Iroha performs at the Ichimuraza in the kaomise "Hankaichô Tsuwamono Zoroe". 3rd lunar month of 1702: Iroha's rank in the Edo hyôbanki, wakaonnagata section, is jô-jô (superior - superior). 11th lunar month of 1702: Iroha performs at the Ichimuraza in the kaomise drama "Yorimasa Hôraizan". 1st lunar month of 1704: Iroha goes back Ôsaka; he plays the role of Otora in the ni-no-kawari drama "Kannon Ryakuengi", which is produced by Kataoka Nizaemon I. 3rd lunar month of 1705: Iroha plays in Kyôto the role of the keisei Naniwazu in the new year ni-no-kawari drama "Keisei Inaba no Matsu", which is produced by Sakata Heishichirô at Hoteiya Umenojô's theater. No record afterwards. Sodesaki Iroha I was a Kamigata onnagata actor, who spent a few years in Edo as well. He was very good in keisei or nyôbô roles and he excelled in nuregoto. He unfortunately died too young, before being able to achieve the same level of fame as his elder brother Sodesaki Karyû. In the Ritsumeikan University Actors Database, Sodesaki Iroha was reported as being the first stage name of Wakaura Kinjûrô (who was Sodesaki Iroha between 1688 and 1712, Sodesaki Wakaura I between 1712 and 1721 and finally Wakaura Kinjûrô from 1721). We've discarded this version and stayed in line with the data from Nojima Jusaburô's book "Kabuki Jinmei Jiten".